Now that summer is here, one thing I’m really enjoying is not having my mornings so rushed. No more racing to make school lunches, getting kids dressed, and hurrying to the bus stop. While I still have lots to do every morning, I have a little more time for things like breakfast. A couple of years ago, Kate and I went to the Thermador headquarters and there we spent a day with Chef Brad, the king of grains. 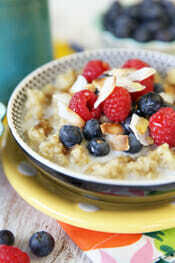 We had a fabulous breakfast and one of the things Chef Brad made was a hot whole-grain cereal. I looked at the recipe later and it contained like, 9 different grains, half of which I hadn’t heard of before, but it was so good. 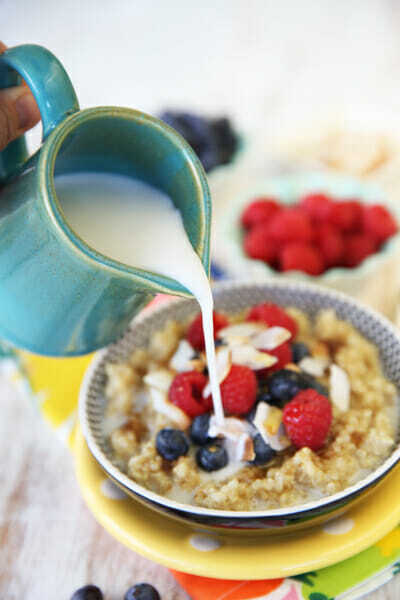 He served up hot bowls and then we could top it with different types of milk, fresh berries, and almonds. That dish, which I still remember after all this time, was the inspiration here, but I wanted to make it a quick and easy recipe, and with ingredients that were a bit more accessible. I really like steel cut oats, but I hate how long they take to cook, and my kids aren’t too keen on the crunchy texture. 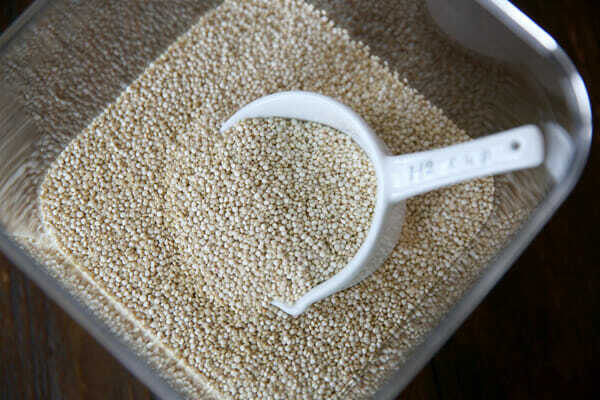 Quinoa has a texture much closer to oatmeal, so it works exceptionally well in sweet dishes. As a legitimate “super food” quinoa packs a punch with a higher protein content than any other grain, and it’s complete protein, meaning that it provides 9 essential amino acids. It’s also rich in fiber, and low on the glycemic index. Sounds like a good thing to have for breakfast, right? Quinoa, like rice and pasta, absorbs liquid as it cooks, allowing you to actually flavor the grain during the cooking process. Just like we sometimes use broth and seasonings to cook rice and pasta, here I’m using coconut milk. For recipes like this, I always use coconut milk from a carton, which you can find in the dairy section of the grocery store. 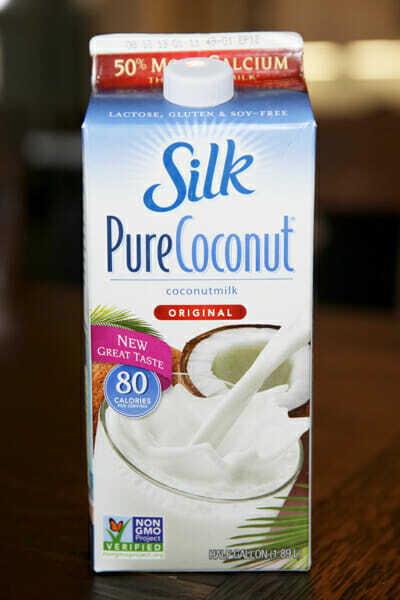 It has a thinner consistency than even light canned coconut milk, and is generally lower in fat and calories as well. If you’re concerned about buying a whole carton, it’s actually about the same price as a can, and it’s yummy on cereal and in smoothies. You can also use it to make coconut rice to go along with this recipe! 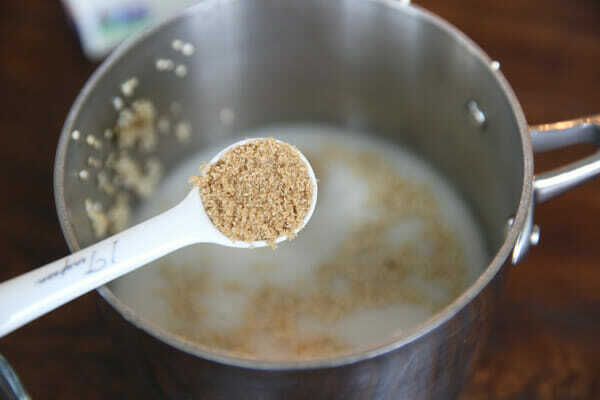 Just place your rinsed and drained quinoa in a pot and add in the coconut milk in place of water. I recommend using a pot that’s slightly larger than you think you need because the coconut milk bubbles up quite a bit during cooking. I also add a touch of brown sugar for sweetness and a little almond extract. The extract doesn’t give a huge amount of flavor (you can add more, or add it later in the cooking process for a stronger flavor) but I find it enhances the other flavors in this dish and adds a mellow sweetness. After the mixture comes to a boil, reduce it to a low simmer and cover the pot. Since coconut milk has a thicker consistency than water, you’ll want to stir it a few times during the cooking process, and if you find that as I mentioned- the coconut milk is bubbling up too much (and out of your pot) you can crack the lid. PS – ignore my dirty stove top. You’ll want to cook the quinoa until most of the liquid is absorbed and the quinoa is soft. Because this is a breakfast cereal, it’s okay to play around with it and add more liquid if you need it. 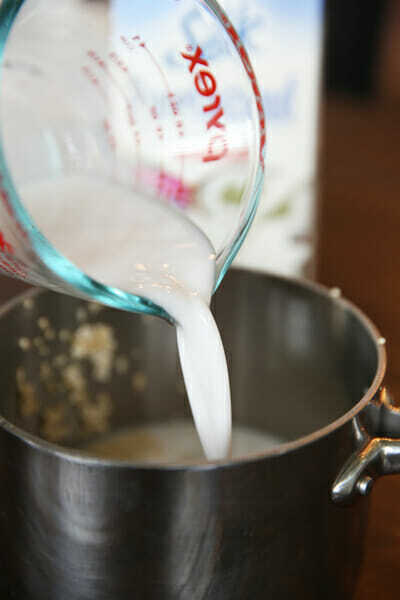 Since we stir the mixture during cooking, we’ll lose a little of our moisture and toward the end, I sometimes add a little extra water or coconut milk to keep it nice and soft. 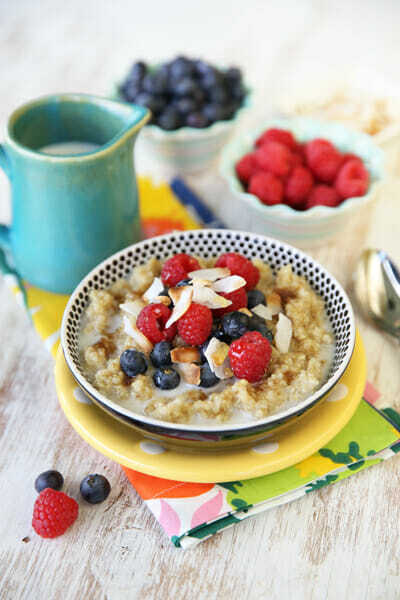 I like mine to be a little porridge-like, so you can customize yours the way you like it as well. When it’s done cooking, serve it up hot. Add fresh berries, some toasted coconut, and a splash of cold coconut milk. I also like a little drizzle of agave syrup (or you could use honey) and a tiny bit of brown sugar (I use this Splenda brown sugar mix). I love the crunch from large flake coconut. You get nuttiness without putting actual nuts in there. And the fresh berries add a pop of both color and flavor along with all of those healthy anti-oxidants. Another thing you can do to save time is cook a big batch of the quinoa and keep it in the fridge. You can pull out a single serving in the morning and just heat it up in the microwave and then add all of y our toppings which you can have all ready to go. I do that for myself so I won’t run straight for the Golden Grahams. Beautiful to look at, delicious to eat, and good for you inside and out. 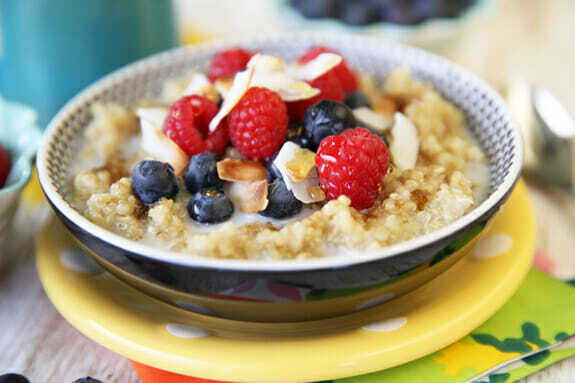 This yummy Breakfast Quinoa is sure to please everyone in the morning! Rave reviews on this one! 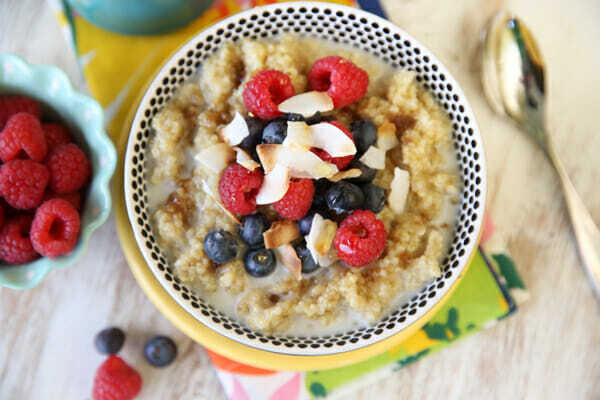 Place rinsed and drained quinoa, coconut milk, brown sugar, and almond extract in a medium-sized pot. Stir ingredients and bring to a boil. Reduce heat to a low simmer and cover pot, preferably with a clear lid (so you can see through it and keep an eye on the quinoa). Stir a few times during cooking. 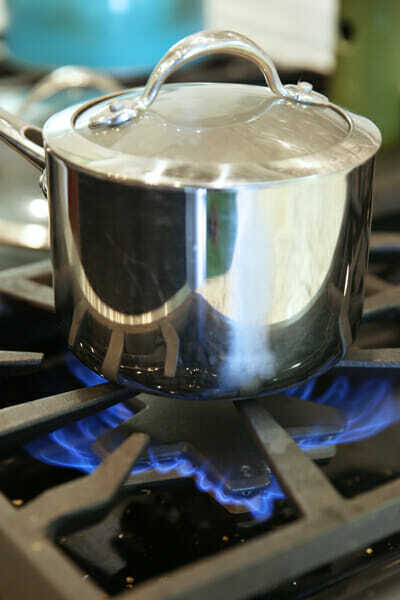 If mixture seems to be boiling out, crack the lid to release steam, otherwise, keep covered. Cook for 10-15 minutes, until liquid is absorbed. In the last few minutes of cooking, feel free to add a little more liquid (water is fine, or additional coconut milk) until desired consistency is reached. I prefer my breakfast quinoa on the soft side with enough liquid to make it more of a porridge. 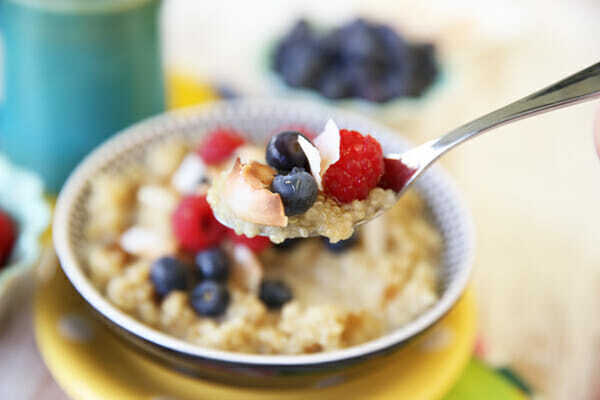 Divide quinoa into bowls and top with fresh berries, toasted coconut and a splash of additional coconut milk. 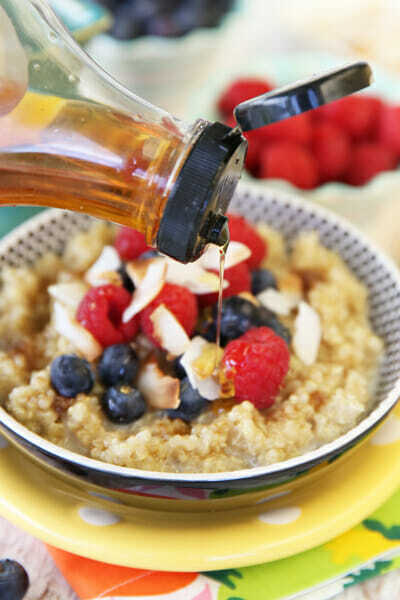 If desired, add a drizzle of honey or agave or a sprinkle of brown sugar for sweetness. Yields, about 4, 1/2 cup servings. Coconut-almond! I love coconut and this quinoa is calling my name. What a perfect breakfast! I love this, Sara. I eat regular oats almost every day for breakfast, and steel-cut when I have time, so I’m thrilled to have a third option. This looks so yummy; thank you for sharing! America’s Test Kitchen has a recipe for 10 min. steel cut oats. You soak them in boiling water the night before and then in the morning, more liquid is added and the oats are cooked for about 6 min and voila! 10 min steel cut oats. ooh, I’ve seen that but never tried it. I’ll have to try it out! What a combo. I love quinoa and coconut. Would have never thought to put the two together. Thanks. My crew is not such a huge fan of nuts or berries. They like the coconut rice though so I’m thinking they might eat this. I prefer coconut with citrusy flavors. Would there be a problem cooking this with a citrus extract instead of almond? Okay, so this doesn’t entirely relate to this post but I just had to tell you about how you guys have helped me out without even knowing it. :0) During my last pregnancy (baby is 5 weeks old now :0) I used recipes from your healthy meals section along with a few of my own healthy favorites to create the perfect menu. I was determined not to gain too much weight this time and with all of your yummy healthy recipes (sprikled with a few of your not-quite-so healthy-but-freakishly-yummy-recipes) I was able to gain the right amount of weight and now 5 weeks later it is all gone! I still have quite a bit more I need to do to get to where I’d like to be though, so keep those healthy recipes comin’!!! And thank you for being awesome! Wow – good job losing the baby weight in 5 weeks! I’m in awe of you! So I make this exact same breakfast, but with oatmeal instead of quinoa. I am not sure why I had never thought of swapping the old fashioned oats for the quinoa, as we always have both. I will be making this tomorrow! Yum! Thanks! I make a bunch of steel cut oats then put leftovers in the fridge like you do with this quinoa. Instead od heating the leftovers the next morning I mix them with Greek yogurt in the morning. Add fruit an it’s a huge breakfast for 5 ww pointsplus! Can’t wait to try this quinoa. Looks delicious! Just for a reference, what size pot did you end up using? 4 qt? 3 Qt? Plan on buying some of this grain. Once before I bought it and since my husband didn’t care for it, and I didn’t know what else to use it for, out it went. Ah, but now this looks like something I would eat. As I love hot oatmeal, this should work just fine. This looks so yummy! I’ve never cooked quinoa, but I’ve heard you have to rinse it. Is that right? I just read another readers comment that you have a healthy section in your index… I guess I didn’t realize that. Thank you for this. I appreciate the whole grains recipe. I’d love to see you do more of this kind of stuff, including dinner recipes. Yum! I am making this soon. I love coconuts and I love quinoa. Good mornin’! loving this idea. i have been bored with my go to healthy breakfast recipes! can’t wait try this. and…. 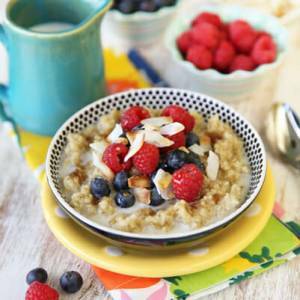 quinoa for breakfast! genious! Thanks for the gluten free recipe. Sure love that you are integrating some gluten free options for those of us who love your sight, but have special dietary restrictions. I feel loved. This looks wonderful! I’m excited to try it. I don’t use the full amount of butter/olive oil and I use almond milk, but I’m sure coconut milk would taste great too. Sounds like a delicious gluten free recipe. Thank you. This looks so freaking lovely! Perfect way to start the morning! Oh my gosh! his is soooo awesome! thank you so much for sharing. You guys have an truly inspiring blog I love all of it. Thank you, thank you, thank you! This was awesome! My two-year-old, who will not eat oatmeal or savory quinoa, devoured this…as did the rest of us. We will double it next time. And I love Chef Brad! It’s nice to have some grain inspiration that uses grains I’ve actually heard of and have in my pantry, though! Thanks for a great recipe! Made this for breakfast and everyone loved it. Hubby said it was good! Made this for breakfast this morning and I will admit I was very nervous at first because I haven’t had much success with quinoa. To my surprise it was delish and a success! It’s a keeper! Loved this! I’ve made it twice. Once with Coconut milk. The 2nd time, I made it with almond milk. After cooking, I stirred in a little regular (not light) canned coconut milk, so it was like thick coconut cream in a bowl of yumminess! As for portion size, I must eat a lot more than you do because this recipe made just barely enough for me and my 3 year old. 🙂 I will double it next time so we have leftovers for the next day. Thanks! My husband ate this all by himself. He’s a muscular guy so he eats a lot to “refuel”. He loved this recipe. I only had a bite, but it was yummy. I have also added some low sugar Greek Yogurt to use them up before the exp dates. Fresh peaches when in season to us them up too. I fix my Steel Cut oatmeal for the week, in single serving containers. It is fast and easy to have before my early morning workouts. I can’t use the full container of coconut milk–could I freeze portions of the milk in an ice cube tray??? I couldn’t find Coconut Milk at my local store, so I used Almond Milk instead. I have been looking for a new way to prepare Quinoa, so this is perfect. Kids ate it up just like it was oatmeal. Everyone loved it. Thank you for this recipe! My previous breakfast quinoa recipe made me dread the morning. Here’s how I adapted it. You can add a tablespoon of blackstrap unsulphured molasses for extra iron, vitamins and sweetness instead of brown sugar. It is delicious! Also added a little vanilla extract and cinnamon. Made mine with frozen blueberries and peaches added at the very end, which defrost in the pot making it ready to eat. Can’t wait to try this. Ever use the ready made 50/50 Coconut-Almond Milk blend? I can’t always find it in the stores, but it is really yummy! I love it in a glass, so I will try it in this, too! Love your site and these recipes and fabulous.. But I did want to mention that to be careful when buying almond milk or coconut milk or the 50/50 some has Carregeenan in it.. Not a good ingredient.. Just a thought 🙂 Can’t wait to try this and many more of your recipes!! Made this morning and had to post. I try healthy recipes all the time that look good but the taste is far from appetizing. Well not the case here. This was delicious. And I agree, I don’t know how you share this with your kids Sara! I want it all to myself. Ate half this morning, going to eat the other half tomorrow! Thanks for the fantastic recipe!!! i LOVE Chef Brad. He lives near me and I have been to several of his classes. So fun to see that he has inspired you as well.